Image credit: California Department of Fish and Wildlife. They were birds. Loons, common murres, red phalaropes, northern fulmars, rhinoceros auklets, brown pelican, and western snowy plover — over 50 species in total were killed. Hundreds of dead birds littered San Francisco's beaches, their wings dripping with heavy, black oil. During an oil spill, birds come into contact with oil when they dive through polluted water in search of food. If their wings become too oil laden to fly, then they drown in open ocean. Lightly oiled birds can still fly, but they risk ingesting oil as they attempt to clean themselves. In the winter of 1973 as the bodies of dead birds continued to wash up on shore, an eerie feeling took hold of the city. Though it wasn’t the carcasses themselves that inspired such dread. The spooky part — the truly terrifying conundrum — was that no one knew where the oil came from. No ship had sank. No pipe had burst. The events leading to the deaths of the birds were shrouded in mystery. It was a mystery oil spill, and it happened again, and again. Every few winters the oily killer would re-appear, as if from nowhere. 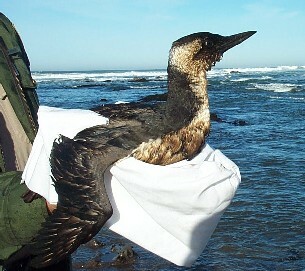 Between 1973 and 2002 an estimated 300,000 gallons of oil leaked into the water killing more than 51,000 birds. An article referred to it as “a murder most fowl,” and it was dubbed by local newspapers as the “Mystery Oil Spill of San Mateo.” With laws in place to protect the environment from oil spills — especially when endangered species are impacted — the pressure was on to identify the cause of the pollution. And it was the job of scientists from NOAA, the U.S. Coast Guard, the U.S. Department of the Interior, and California’s state agencies to solve the mystery. It’s a scientist’s job to hunt for answers, and luckily, NOAA has scientists who have dedicated their careers to solving the mysteries of oil. Oil is composed of thousands of chemicals, some of which can be used to identify its source. They analyzed the chemical fingerprint to begin the process of elimination. They determined that the oil had not naturally seeped from the seafloor. And it wasn’t the most common type of oil transported along the Pacific coast either. By comparing the fingerprint to oil from boats traveling through the area, they were able to rule out illegal dumping as well. Satellite imagery offered another important clue. Scientists were able to locate an oil sheen floating on the ocean surface, and using their knowledge of currents, they traced the oil back to the source. This led them 17 miles southwest of the Golden Gate Bridge to deep and frigid water. It led them to the grave of the S.S. Jacob Luckenbach. The Luckenbach was a 468-foot freighter bound from San Francisco to South Korea. It was a foggy morning on July 14, 1953, when it collided with the S.S. Hawaiian Pilot. While the other ship was slightly damaged, the Luckenbach began taking on water fast. It sank within 30 minutes with 470,000 gallons of oil on board. After the collision the Marine Board of Investigation compiled a report and insurance companies paid out claims for both vessels. The S.S. Jacob Luckenbach was forgotten until 2003 when it was discovered to be the source of the mystery oil spills of San Mateo. Now that the cause of the mystery spills had been identified, the next step was stopping them. The U.S Coast Guard sent a remotely operated vehicle (ROV) down to explore the shipwreck. It was no easy task. Fast currents jostled equipment, and the water was so dark and murky the ROV could only see 5 feet ahead. What they found was astonishing. The wreck had become an artificial reef, providing habitat to octopus, crustaceans, and schools of rockfish. Ghost nets, abandoned to drift in open water, snagged on the wreck like cobwebs. When they turned off the lights the wreck glowed a ghostly green, illuminated by hundreds of bioluminescent sea anemones. After evaluating the state of the wreck, the Coast Guard announced a $3.5 million contract to remove the remaining oil. 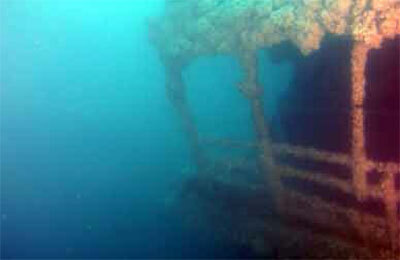 Highly trained divers used “dive bells,” structures the size of an elevator, to descend to the wreck. To avoid decompression sickness, these divers stayed in the dive bells or an on-board compression chamber for up 28 days at a time. Through a tedious process of drilling holes and syphoning oil, divers removed roughly 100,000 gallons of fuel. However, because the oil was located in many different places within the wreck they couldn’t reach it all. An estimated 29,000 gallons remains, sealed by divers beneath the ocean's surface. After the cleanup, government officials began an environmental damage assessment and restoration plan to submit a legal claim for restoration funds. Due to the nature of this case, with the owners of the Luckenbach no longer viable, the Oil Spill Liability Trust Fund was used to fund cleanup and to restore resources damaged by the spill. The S.S. Jacob Luckenbach taught NOAA and Coast Guard officials a great deal about tracing and resolving underwater oil spills. It is considered a landmark case in the development of underwater assessment and oil removal technologies. Today, the wreck of the Luckenbach still lurks beneath the waters of the San Francisco Bay. NOAA uses the same technology it used to identify the source of the mystery oil spill to monitor it. Scientists are watching, waiting, ready to respond if the oily killer strikes again. Click on the links for more information on other potentially polluting shipwrecks, how oil seeps from shipwrecks, restoration from oil spills in California, or the S.S. Jacob Luckenbach.